Peplums and jewel tones are a perfect combination in my book. You'll also find these pants in my book as well..tailored, comfy and just the right bit of stretch to feel like I'm wearing leggings. Yes, please. Oh, and this book? Just the archive of things I love..sometimes referred to as 'My Style Pinboard' on Pinterest which has been taken over by a plethora of cozy fall sweaters, boots and scarves. This is about as fall I'm going to get for awhile, as it's still in the 90s here. Hey, I'm not complaining. Love your stacked rings--so pretty!! love this peplum top on you & purple is a great color too! I am so ready for fall, my pinterest board is overflowing with fall fashion! 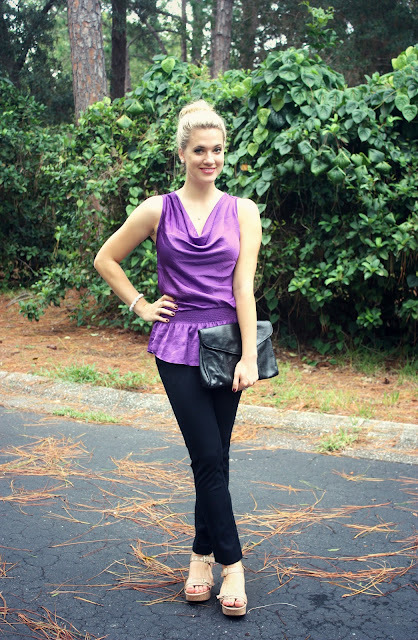 ah peplum. how wonderful you are. Pretty outfit, girl! I'm so ready for fall, favourite fashion season.